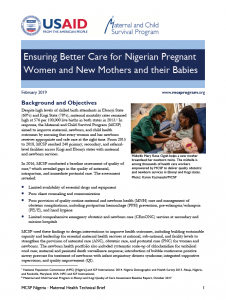 Adverse birth outcomes, including low birthweight (LBW), small-for-gestational-age (SGA) and preterm birth, contribute to 60–80% of infant mortality worldwide. Little published data exist on the association between diarrhea during pregnancy and adverse birth outcomes. 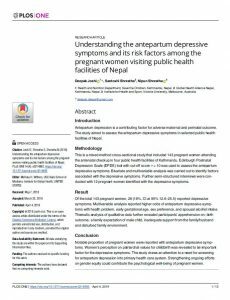 Data was used from two community-based, prospective randomized trials of maternal influenza immunization during pregnancy conducted in rural Nepal from 2011–2014. 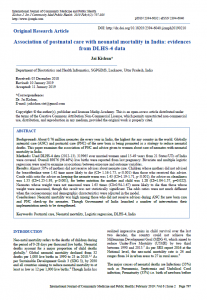 Diarrheal illnesses were identified through longitudinal household-based weekly symptom surveillance. Diarrhea episodes were defined as at least three watery bowel movements per day for one or more days with seven diarrhea-free days between episodes. The Poisson and log-binomial regression were performed to evaluate baseline characteristics and association between diarrhea during pregnancy and adverse birth outcomes. 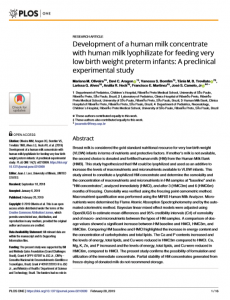 A total of 527 of 3693 women in the study (14.3%) experienced diarrhea during pregnancy. Women with diarrhea had a median of 1 episode of diarrhea (interquartile range (IQR) 1–2 episodes) and 2 cumulative days of diarrhea (IQR 1–3 days). Of women with diarrhea, 85 (16.1%) sought medical care. 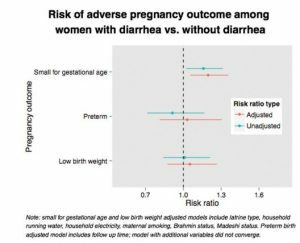 In crude and adjusted analyses, women with diarrhea during pregnancy were more likely to have SGA infants (42.6% vs. 36.8%; adjusted risk ratio=1.20, 95% CI 1.06–1.36, p=0.005). LBW and preterm birth incidence did not substantially differ between women with diarrhea during pregnancy and those without. 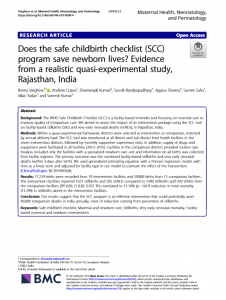 Diarrheal illness during pregnancy was associated with a higher risk of SGA infants in this rural South Asian population. 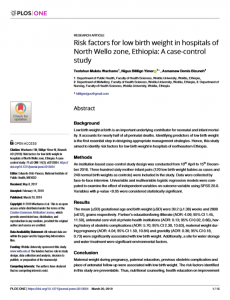 Interventions to reduce the burden of diarrheal illness during pregnancy may have an impact on SGA births in resource-limited settings.